Central Electric is a member of South Dakota One Call, a communication link among utilities, contractors, and private individuals who work with or around underground lines or pipes. If you plan to dig a hole or trench more than a foot deep on your property, you must phone South Dakota One Call toll free at 800.781.7474, at least 48 hours before you plan to excavate. They have up-to-date records on electric, gas, phone and other utilities. They can help you avoid loss of service by accidentally severing one of these lines or pipes. Your call may also avert a possible serious incident. When requesting an underground locate, please be aware of the difference between primary and secondary lines. Primary lines are the lines owned and maintained by Central Electric that lead up to your meter. These lines are located for free and maintained at the cost of the cooperative. These lines are located by calling 811. Secondary lines are lines after the meter that lead up to your home, shed, barn, wells, etc. The member owns these lines, and these lines are located and repaired at the cost of the member. In order to locate secondary lines, a member will need to hire someone. Central Electric does have the equipment to locate lines and you can contact us to have one of our electricians locate these lines for you. 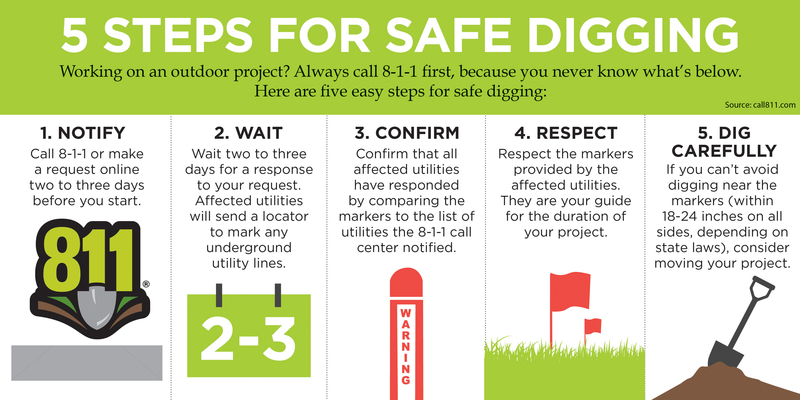 Call 811 or submit an electronic ticket 48 hours before any digging project.